Chauffeuring your wedding guests is a great way to keep everyone together and make sure no one is running late. Of course, there’s an even better reason than just convenience – making memories. Your wedding day is going to be a memorable event anyway, but imagine having a little extra time to make a few extra memories. Your wedding often brings people together that you rarely see and that rarely see each other. It’s the perfect time to laugh and talk, but during a crowded reception and quiet ceremony, people might not get to visit much. Make it easy by chauffeuring your wedding guests so they’re able to make memories too. Whether you’re riding with your guests or not, a limousine provides the perfect way for your guests to spend more time together. It might be the first time all your siblings, cousins and other relatives have all been together. Chauffeuring your guests gives them a chance to catch up in a peaceful environment. Instead of everyone driving separate, they’re able to visit freely without focusing on traffic. Out-of-town guests always have a difficult time navigating. Why not make life a little easier on them by chauffeuring them around? An even better option is to have a few local guests ride with them to point out various sights, great restaurants or other areas your guests might want to visit during their stay. Chauffeuring your wedding guests around in silence isn’t exactly a memorable experience. Put together your own soundtrack that’ll have them all laughing and remembering their favorite times together and with you. This is also a great option for the bridal party limo as well. You could even offer special mix CDs in the limo for guests to take with them as a party favor. All your friends have probably went their separate ways for work, romance and other life changes. Imagine the memories they could make if they were only together again for a little while. The wedding tends to be more about the bride and groom than visiting each other. Chauffeuring your wedding guests around gives old friends a chance to laugh about the past and make new memories along the way. Limousines are more than just a set a wheels. They’re a place to relax and have fun. Set up some fun games in the limo for your guests to play. Trivia, charades and guessing games are perfect. If you can tie them into the wedding or make them about you and your future spouse, that’s even better. You’ll have guests arriving talking about how much fun they had on the way over. While it might be safe for your guests to drive themselves to the venue, it’s probably not safe for them to drive home. An open bar seems like a great idea until the reception ends. Make sure your guests make wonderful memories on the way home by having a limo ready to chauffeur everyone back to their home or hotel. It’s safer for your guests and they’ll make plenty of fun memories on the way home. Sometimes your guests might not be comfortable laughing and talking freely when there are other guests around they don’t know. Group your guests together with people they’re comfortable with. 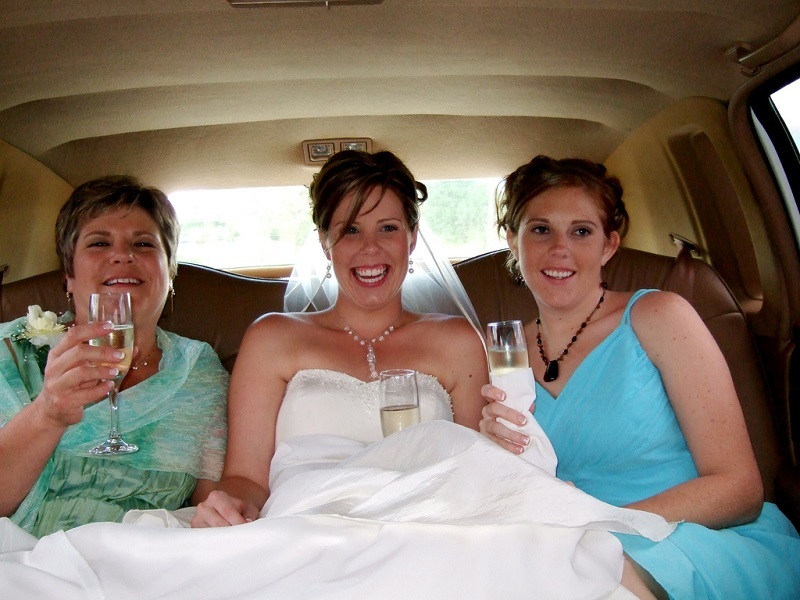 They’ll love having the time in the limo to talk, laugh and just have fun. Instead of sitting quietly, they’ll make memories and enjoy your wedding even more. Chauffeuring your wedding guests isn’t just a nice gesture. It’s also a good way to ensure guests are happy and excited as they arrive. They’ll have plenty to tell you about the ride over as well. If you want to make sure you don’t miss anything, place a scrapbook and camera in the limo for guests to write down memories made, take pictures and write funny well wishes. They’ll have memories and you will too. Ready to help make some memories for your wedding guests? Contact American Limousine Service today to hire the right limousine or limousines for your guests.